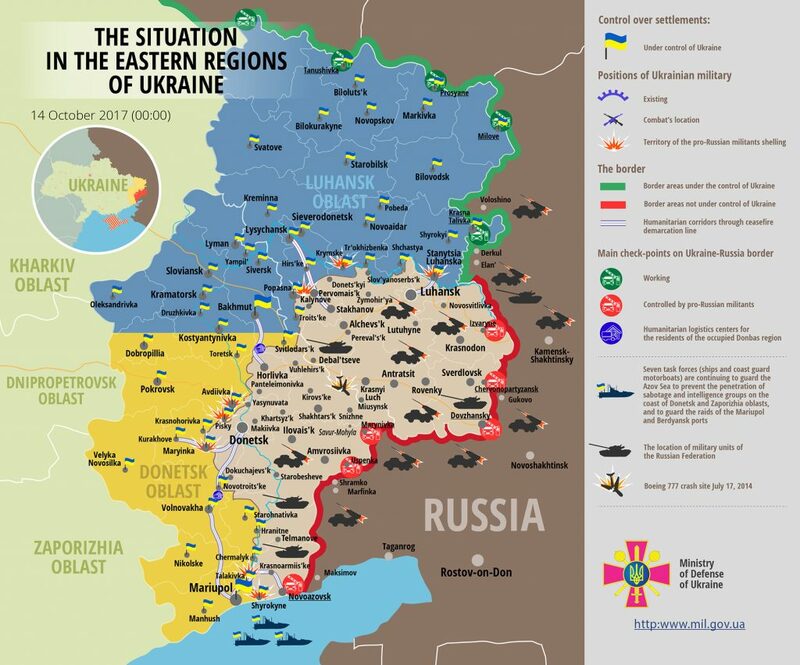 The situation remained difficult in the ATO zone yesterday. In total, militants conducted 21 attacks at ATO troops’ positions, 18 of these were aimed. “Ukrainian troops responded with adequate fire to most violations,” reported Ukrainian Ministry of Defense spokesman on ATO Colonel Andriy Lysenko at a press briefing at Ukraine Crisis Media Center. In Luhansk sector, Russia-backed militants opened dense aimed fire using small arms and grenade launchers. Moreover, they used 82-mm mortars twice firing a total of five rounds near Krymske and Novooleksandrivka. Ukrainian troops responded with fire. Seven hostile ceasefire violation were recorded in Donetsk sector. “Starting midday Russian proxies were periodically using small arms and grenade launchers. In addition, hostile IFV opened aimed fire at Ukrainian strongholds near Zaitseve in the evening,” said Col. Lysenko. Militants conducted the largest number of hostile provocations near Pisky. They used small arms and grenade launchers three times, each time from a different direction. “Ukrainian troops responded harshly, opening aimed fire and making the enemy abandon their attempts to escalate the situation,” emphasized the spokesman. In Mariupol sector, militants conducted seven aimed attacks at Ukrainian strongholds. “The most significant engagement took place in the vicinity of Vodiane where the enemy attacked Ukrainian troops three times,” said Col. Lysenko. Ukrainian soldiers had to respond with fire to two hostile provocations near Shyrokyne. No Ukrainian serviceman was killed in action, but one soldier was wounded near Novooleksandrivka. “In addition, a State Border Guard Service serviceman sustained a gunshot wound as a result of hostile sniper fire. Both casualties were evacuated to hospital and provided medical aid. Their wounds are not life-threatening,” added the spokesman. Report on the military developments as of October 13 is available here. Interactive data on the shelling: chronology shelling chart and the interactive map.